054: Mentalist William Rader talks about selling tickets online! 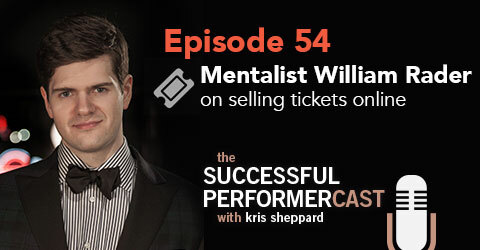 S5E6: Mentalist William Rader talks about selling tickets online! In this interview, William Rader talks all about the ins and outs of selling tickets to your shows online and why he decided to create his own platform in an attempt to solve the issues from the big dogs in the industry. For the past decade, William has traveled the country mesmerizing audiences at exclusive parties, universities, and corporate events with his show entitled, “An Enchanted Evening.” His show has been seen by thousands of people. With his new project, WellAttended, William has also been working to solve a problem in the entertainment community of how to sell tickets to your show online without having to mess with the big dogs of the industry. WellAttended is a simple platform that makes it quick and easy to create a site and sell tickets online. • Tells how he started performing theater shows in restaurants. • Discovered he could make more money doing a theater show rather than doing strolling magic. • Tells how he was originally selling tickets online and why he decided to create his own platform, WellAttended. • The exorbitant fees that the “big dogs” charge. • Created a more intuitive ticket-selling process—essentially a better machine. • How he’s been listening to his users to find out what they need and implementing them as new features to his service. • WellAttended is intended for performers producing smaller scale shows that they want to sell tickets to online. • Breaks down his much more reasonable fee structure and how that works. WellAttended is a simple platform that makes it quick and easy to create a site and sell tickets online. Feature your brand by uploading your logos, images, and social media profiles. You can use WellAttended if you already have a site or if you want to create one dedicated to selling tickets. • Talks about working with a developer to build a product and bring his vision to life. • Brainstorming and his creative process. • Talking to people who are using similar services and building your product based on that. • Building something you’re passionate about. Finding new users for his system. Found the “perfect place” to have a theater show at and gave them his promo materials. They promised to promote the show but never did. He trusted them, but ended up having to cancel the show. Getting his first standing ovation for his theater show. A notepad and pen. Specifically “field notes” notebooks. Get it FREE on her website! Where can we find William Rader? ← S5E5: Phil Ackerly talks about losing his day job and then going full time performing magic!